Take a walk around your neighborhood. Chances are within a couple of blocks, you will pass things like benches, fire hydrants, planter ledges, mail boxes, etc. To the average person, these are just everyday objects that do not attract much attention. Now imagine your dog being able to balance on these objects, walk across them, or jump up onto new surfaces – your mundane neighborhood walk just took on a whole new life! I fondly refer to the utilization of these everyday objects as “urban agility”. Agility training in general is a fantastic way to build your dog’s confidence, body awareness, and strengthen your working bond. Introducing these obstacles might seem challenging at first, but with the right guidance, it becomes a wonderful way to engage your dog in the world around them. Let’s start with something simple. Benches are a great place to begin teaching your dog how to engage in some urban agility. Lure your dog using their preferred toy to treat to climb onto the bench. Ask them to offer you simple positions (sit and down) on the surface to build their awareness of how they fit and can balance on the bench. You can also have your dog walk along the bench and balance as they walk across it. Parking meters provide a great chance to work skills like weaving or circling around an object. Using a lure, you can help you dog learn to maneuver around and through those narrow spaces, much like a formal agility weave. I also enjoy teaching my dogs to send out and circle around an object. Standing in front of the thing you are asking them to circle, lure them around one side and reward them once they are on their return back to you. As the dog gets more comfortable with this exercise, increase the distance and the size of the object – my favorite is sending a dog back and forth across a park to various trees! 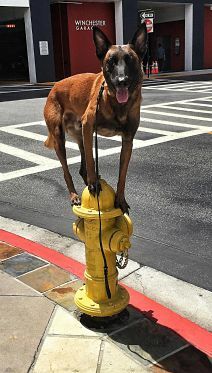 Now my favorite urban agility trick is getting my dogs to balance on a fire hydrant. This takes a bit of time to build, but it is SO much fun once it’s done! 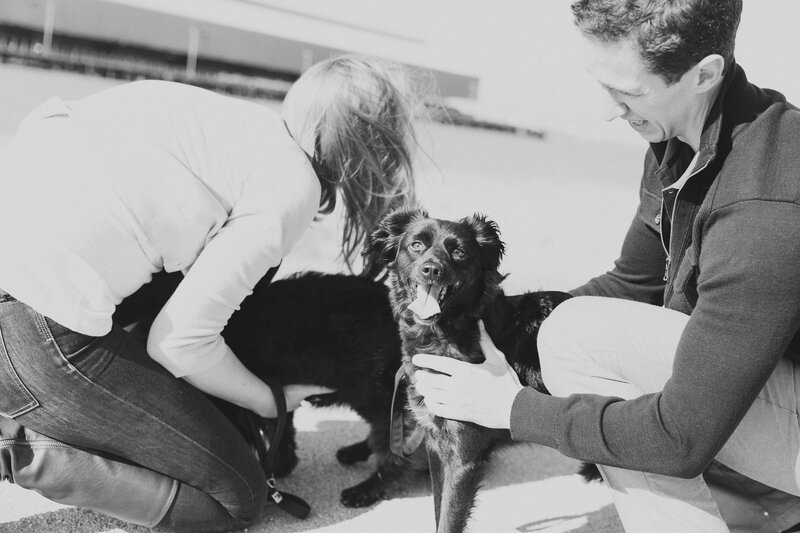 I start with getting my dog to ‘target” the hydrant – place their front feet on the surface and hold there. When the dog offers this consistently, I will help raise their back end on the surface, supporting them by hold their belly and collar while they figure out how to balance on such an awkward platform. When they’re able to balance on their own, I begin asking them to jump up themselves. Always remember to support your dog while they are learning new skills. Stay close to your dog to help provide any extra assistance they may need while learning to prevent accidents or injuries. Use high value rewards for encouragement. These types of activities are meant to be fun for your dog, so always use lots of enthusiasm, celebrate with your dog and enjoy your successes together! If you enjoyed this post, you should read Why I Don’t Ask To Pet The Future Guide Dog here. My pups are good at the tree thing-we’ll have to practice the others. What urban agility moves do you do with your pup?